Senator wants to defang the ‘radical’ Michigan DEQ. He just may do so. 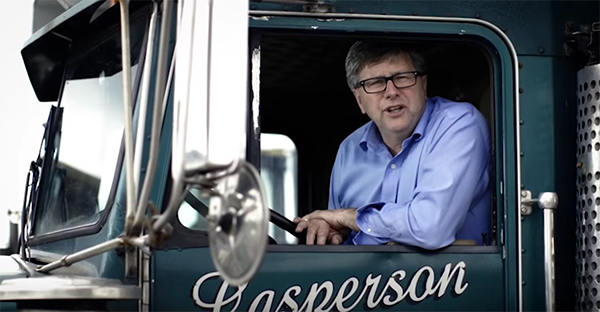 State Sen. Tom Casperson, R-Escanaba, spent more than two decades working alongside his father in the family log trucking business. Bill by bill in 15-year political tenure, he has changed the way Michigan manages many of its natural resources. LANSING — Visitors to Sen. Tom Casperson’s state office suite might surmise his environmental priorities as soon as they walk in. "IF YOU OBJECT TO LOGGING, TRY USING PLASTIC TOILET PAPER," instructs a green placard hanging near the door. Before turning to politics, the Republican from Escanaba spent more than two decades alongside his father in the family log trucking business — an experience that helped shape his pro-industry, pro-private property rights belief that Michiganders would be better off if regulators did less regulating. His views matter mightily. In his eighth year as chairman of the Senate Natural Resources Committee, Casperson — who wears black-rimmed glasses and speaks in a Yooper accent — has, bill by bill, changed the way Michigan manages many of its natural resources. In a 15-year political career that began in the state House, Casperson, 58, has championed several landmark bills that are now law. His legislation — often fought by environmentalists — has regulated metallic mining in Michigan, capped how much land the state can own, removed wolf hunting restrictions and cut red tape for those wishing to groom beachfront property. If not for a governor’s veto, Casperson would have also eliminated the Department of Natural Resources’ duties to consider plant and animal biodiversity in managing forests. Now, in his final year in the Legislature, the term-limited senator is pushing perhaps his most sweeping effort yet: to fashion private-sector panels — one populated largely with industry representatives — that could override Department of Environmental Quality rules and permit rejections. Casperson said environmentalists wield all the power at the DEQ. In an interview with Bridge Magazine, Casperson said the DEQ is overzealous, quick to deny permits and levy penalties, and fueled by a “radical left-wing” environmental agenda. Agency staffers “hate” mining, he said, and aren’t fans of other extractive industries. Environmental groups call his package of bills the “Fox Guarding the Hen House Act,” arguing it would defang a regulator that’s already lost some teeth due in part to years of budget cuts. Casperson's legislation — Senate Bills 652, 653 and 654— cleared the Senate last week and moved on to the House. The proposal would undercut DEQ’s power by allowing governor-appointed panels to overturn agency decisions. It’s modeled on a setup in Indiana. An Environmental Rules Committee would “oversee all rulemaking of the Department of Environmental Quality,” under Casperson’s legislation. Six of 11 voting members would represent industries or businesses (solid waste management, manufacturing, public energy utilities, oil and gas, agriculture, small businesses). Other members include representatives from an environmental organization, a local government, a land conservancy group, the medical field and the general public. As currently written, registered lobbyists could serve on the committee if they didn’t represent more than one client. Meanwhile, a Permit Appeals Panel would resolve permitting disputes at the agency. Aggrieved parties trying to alter floodplains, drill for oil, mine minerals — or do most anything requiring DEQ permission — could seek relief. The panel’s 15 members would need to meet certain educational and professional requirements, and they could not work in state government. A third bill would create an Environmental Science Advisory Board, which the state formerly had until a decade ago. Casperson has backing from some of the state’s biggest industry groups: the Michigan Farm Bureau, Michigan Chamber of Commerce and the Michigan Manufacturers Association. In testimony to Casperson’s committee, Matt Smego, a Farm Bureau lobbyist, said creating the Permit Appeals Panel would allow aggrieved parties to bring forward scientific information DEQ had not considered. The broader proposal “will provide the DEQ with new tools to increase transparency and accountability,” he said. Occhipinti, of the League of Conservation Voters, said the DEQ already “bends over backwards,” to find compromise during permitting disputes and called Caperson’s legislation an overreach to a nonexistent problem. Bill Rustem, a former adviser to Gov. Rick Snyder and a environmental policy expert, said it’s not unheard of in Michigan to put checks on environmental regulators’ power, which can occasionally reach too far. He suggested the idea could have merits, but the panels’ membership should be scrutinized for balance. Casperson told Bridge he could support adding a conflict of interest provision to his legislation. That might include barring a panelist from voting on a matter that narrowly affects his or her business. But Casperson would allow — and even welcome — members to vote on issues affecting their wider industry. For instance: Could an official with Toronto-based Lundin Mining Corporation, which operates Eagle Mine in western Marquette County, remain on the panel while weighing a statewide mining rule? Environmental advocates say DEQ already closely listens to industry — sometimes more so than they would prefer. Advocates point out the agency’s director, Heidi Grether, is a former oil industry lobbyist and executive who spearheaded BP’s public response to the Deepwater Horizon explosion. But are environmentalists teaming with the agency to set policy, as Casperson says? The agency also rebutted Casperson’s description of its work. Grether recently met with lawmakers regarding concerns about “overzealous” enforcement, she added. “Interactions proved positive, and questions and concerns were answered and addressed in an expedient manner,” she said. MORE COVERAGE: Michigan has 7,300 toxic sites. Money for cleanups is almost gone. DEQ approved 99.5 percent of permit applications — 7,413 of 7,447 — in the 2017 fiscal year and 99.8 percent the previous year, the figures show. Casperson’s proposal is moving quickly through the Legislature. The House — though not yet the Senate — has passed separate legislation that would limit environmental regulators’ power in another way: by barring any regulations stricter than that of the federal government. “We’ve been meeting with legislators and finding general support for the idea, much to our dismay,” said Occhipinti. But getting the bills to Snyder’s desk does not guarantee either would become law. Snyder vetoed a no-stricter-than-federal bill in 2011, saying it could hamper the state’s ability to protect the environment. And in 2015, he vetoed a Casperson bill that, among other provisions, would have struck “conservation of biological diversity” from the DNR’s forest management duties. More than 130 researchers had opposed it. Snyder has not yet taken a position on the bills, spokeswoman Tanya Baker, wrote in an email to Bridge. Though environmentalists have publicly disagreed with the governor over a variety of issues over the years, Casperson said Snyder is too close to those groups. “I wish he’d be a little more neutral, and not take everything they say verbatim,” he said. Snyder’s office pushed back against that characterization. “The governor has always made a point to listen to and take input from everyone at the table, on every side of an issue,” Baker wrote. Casperson is among the worst of the self-serving Senators who put their own personal interests above those of the state and its residents. Term limits can't kick in soon enough for this guy. Someone needs to remind him that the environmental Law starts with the FED. Michigan can only be allowed to enforce this law if it's enforcement is AS SEVERE OR MORE SO THAN THE FEDERAL LAW, ITSELF. So let him take it up with DC. He's a voice of sanity. Sorry to see him leave. Environmentalism has become a left wing cult that will not tolerate any difference of opinion or analysis. Isn't it past time to put people first? I don't know if you have children or grandchildren but you may want to consider the people you want to put first. Environmentalism is based on scientific evidence, and is not a left wing cult. I find those who disagree with any of these issues to be the political adversaries of common sense and tend to be uniformed about the science of climate change. Leaders think about the future and considers all sides of an issue. Our children and grandchildren who are much smarter than we were will be paying for attitudes like yours. Yes, dirty water and air are good for all of us. People don't matter - let's let rich corporations make a mess and for us little people to pay to clean up the mess. Did I sum up your argument well? “Bunch of baloney”, not truthful, not scientific, says not one word about the topic being discussed. please be more articulate and use scientific answers, like accurate numbers, outcome issues based in fact, when discussing your positions. If it were up to Tom Casperson, we'd revert to the, nearly non-existent, environmental standards of the 1960s. That hands-off approach gave us mercury tainted fish, rivers that burned, and the near extinction of the Bald Eagle and numerous other species. It's reprehensible for a state senator to mockingly refer to the concerned and educated DEQ professionals, that serve the citizens of our great state, as a group of “radical left-wing” environmentalists. His petulant overtures that they are "overzealous, quick to deny permits and levy penalties" are the ravings of a myopic bully. I guess that he would rather they stay in their offices, rubber-stamp every permit that crosses their desk, and be lax on penalizing offenders of existing laws! He drove his family's logging trucks for 20 years, but waited until a woman and her child were killed by lousy trucking equipment before asking for state mandated implementation of existing, logging truck safety equipment. That's not leadership, that's responding to crisis. Tom Casperson's efforts to gut the DEQ are short-sighted and politically driven. It's better for the citizens of Michigan to have a science-based DEQ, that performs it's due diligence and is aggressive towards those that would ignore the laws and put the health of Michiganders at risk. If anything, the MDEQ has been hamstringed and starved of staff and resources necessary to protect our Great Lakes "Pure" Michigan state. Casperson needs to walk the talk and drink and use only Flint and Rockford water going forward. Mr. Casperson is a far right wing anti environment kook. He's backed by dark money from invisible far right wing billionaires who could care less about clean water, clean air and public lands. This is what happens when one party rules Lansing through gerrymandering. Since he's term limited, my guess his next job will be as a lobbyist for the mining industry. I own a forestry based business that buys thousands of tons of pulp. Casperson doesn't understand our industry, and never has. These oversight panels could throttle competition, and they will. It's a job-killing political construction, with the people appointed to these panels holding way too much power. The DEQ can be worked with. These panels will be the "haves" keeping out the "have-nots." Disappointingly shallow, insincere and biased reporting. The next time you write about an important package of environmental legislation you might try actually reading the bills first. Your description of the legislation carefully omits or misrepresents key provisions of the bills to conform with your Chicken Little, anti-business narrative. Please be more specific in your criticism. I am here to learn. Public employee inspectors are necessary but don’t let them promulgate rules. Cancel all promulgated rules and make all new rules go thru meaningful public hearings. Polluting the Wells in Pursuit of Clean Water; MDEQ Takes a Swipe at the Tar Baby. I cite an Mlive report last year about 50-70 homes near Knapp’s corner had been contaminated by chloride. Ken Yonker, our new Kent County Drain Commissioner, who told me that it was sodium chloride (rock salt) that had washed off of the parking lots at the Meijers and the other stores on that intersection and into a detention pond. These are “detention” not “retention” ponds and are designed for three purposes 1) slowing the flow of water into the stormwater system so preventing flooding downstream, 2) allowing toxins from the road to settle out and be detoxified in the mud and plants at the bottom of the pond and 3) retaining some water that would seep down into the soil to recharge the aquifer. The water from the large parking lots on Knapp’s Corner had carried dissolved sodium chloride into the detention ponds and this had seeped into the groundwater in the neighborhood. The well water drawn from the aquifer had a with slightly salty taste. Most of the homes had levels lower than that which the EPA considers unacceptable, but a few had troublesome levels. It took only a moment to Google a nearly 10 year old University of Minnesota article on what happens to the stuff that goes into a detention pond. Road salt was well known to remain in solution and to accumulate in groundwater. The pollution of the well water around Knapp’s corner is predictable and a direct result of the City of Grand Rapid’s forcing the developer to place a detention pond into the drainage system. So who imposed detention ponds on us? These seem to have been part of the National Environmentalist Clean Water Act. Detention ponds seem to be a threat to the environment. And it is the MDEQ, right here in Michigan, feeding on our tax dollars, that is the voice of God-ah, the EPA- that enforces poisoning our ground water in the name of some sort of purity. poison in our Water<,,like Flouride to never get cavities ??? more people lose there teehee?baby teeths? Seems like we are heading towards having the Army Corps of Engineers take over our wetland regulations if Casperson gets his way. Also are people aware there is mineral exploration going on in the Porcupine Mountains State Park. I thought these activities were not allowed in dedicated state Wilderness areas. Seems there is too little over-site not too much. Casperson is the same politician who hoodwinked voters to believe the state must regulate wolf hunting because the animals were terrorizing day cares in the UP. All of it was lies and hearsay. Michigan collects CANADA Trash for pennies..
Water in Flint .Air we cannot breaths!